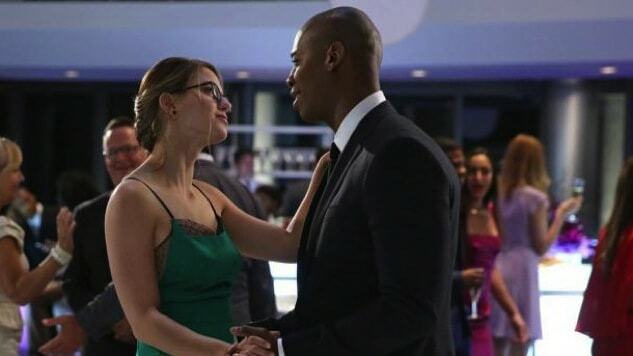 Supergirl 01.03 ‘Fight or Flight’ was a slightly uneven but still satisfying episode, unfairly burdened by its primary function of addressing the Superman issue at the heart of the show. Kara and the audience have Superman on the brain; she wants to escape his shadow and the audience wants to see him in the light. Kara’s cousin is the elephant in the room, but he is not what many worried he would be, a tragic flaw in the concept of the show similar to the Batman-free Batman hijinx of Gotham. Supergirl admits to being Superman’s cousin in her exclusive one on one interview with Cat, and the detail is soon spread far and wide. The news catches the attention of the villain Reactron who has a score to settle with Superman. Supergirl finds herself fighting Reactron in the opening scenes of the episode, after saving a woman trapped on a bus. Reactron flees when his reactor becomes damaged. Henshaw let’s Kara know that the EOD will not assist her in her pursuit of Reactron; the scope of the EOD is threats of an alien origin and Reactron’s suit is man made technology. Kara is upset because she wants to protect people from any and all threats. Henshaw is dismissive of her concern and tells her to call her cousin to deal with the threat. Meanwhile, at Lord Technologies we are introduced to Maxwell Lord and his team of engineers. Lord is typically portrayed as an amoral con man or a charming manipulator in the comics, given his metahuman ability to manipulate others to do his bidding. The Maxwell Lord of Supergirl is more Tony Stark or Elon Musk. Reactron arrives and takes Lord hostage instead of an engineer after Lord convinces Reactron to take the best scientist, him. Alex arrives at The Tribune to give the Super Friends a hand tracking Reactron. The team is able to determine that Reactron needs Thorium-22 and that he gained his powers during an incident at a nuclear reactor that Superman prevented having a meltdown. Kara is dealing with the legacy of both Superman’s success, and his mistakes. Reactron demands that Lord repair his suit so that he can continue his vendetta. Lord determines that Reactron is dying from radiation exposure and offers him a chance to return to the lab for medical assistance. At this point, I am wondering why Lord doesn’t mind control Reactron. Perhaps, Lord doesn’t have powers yet. On threat of death, Lord agrees to help. But he will need a Dr. Pepper. A man after my own heart. Cat asks Kara for her feedback on the Supergirl interview, and the tone of Kara’s voice reveals her dissatisfaction. Cat called Supergirl the Millenial Falcon and entitled, because when she needs help she will just go calling on her family to bail her out. “She’s not a consolation prize. She is every bit the hero he is,” Kara says before James comes in and calls her into the hallway. Winn has tracked Reactron to a junkyard. Kara arrives at the junkyard and attempts to reason with Reactron, but he says that he is already dead and all he wants is revenge. Reactron proceeds to beat Supergirl until she starts to pass out. Superman arrives and scares off Reactron before Kara passes out, saving her and Lord. Kara wakes up at her apartment with The Super Friends, and realizes that James used his special watch to call Superman for assistance. Kara actively rejects her privilege and says, “Why do I have a get out of jail card? He didn’t.” James leaves but he is not sorry for helping. I understand the show has a need to create a justification for keeping Superman out of the show, but it seems silly for Supergirl to completely cut herself off from her mentor. I would have preferred Superman be off planet or missing. That being said, I do appreciate their usage of Superman. Kara came to Earth to protect Superman not the other way around. Kara attends the party in honor of the Supergirl interview, still reeling from the fight. Winn saves Kara from Cat and they hit the dance floor. Cat and Lord dance and reveal that they have a romantic past. Back at the EOD, Alex is in the lab doing research on how to defeat Reactron. Henshaw is walking through the halls when his eyes glow red and he realizes that Alex is up to something. I know Henshaw is the Cyborg-Superman in the comics, but I believe that TV Henshaw is Martian Manhunter. It makes more sense than the cyborg character that is too closely associated with the Death of Superman story. Given Martian Manhunter’s ongoing battle with the White Martians, it makes sense for him to work with a group like EOD that protects Earth from alien threats. Henshaw confronts Alex about her extracurricular activities. Alex lets him know that she can no longer make a distinction between threats. Henshaw asks who else knows about this project, and then he agrees to assist Alex and Kara defeat Reactron. Meanwhile, at the party James cuts in on Kara and Winn. He admits to his reflexive use of the watch to summon Superman, it is part of the reason he left Metropolis. James says, “I press it when I get scared. I did not want to lose you.” This beautiful little moment is cut short when Reactron crashes the party looking for Supergirl. Supergirl excuses herself to slip into something a little more durable. She saves Winn from a falling pillar, but she is a sitting duck for Reactron. James distracts Reactron and lures him away. After Supergirl defeats Reactron, she returns to the EOD where Henshaw agrees to open up the scope of the organization. Alex tells Kara to look for James and have a celebratory date. Unfortunately, Kara finds him with his ex Lucy Lane. Kara is saddened by this unforeseen complication. Clark texts her and congratulates her on a job well done. Later that day, Alex and Kara enjoy chinese food and bond. Kara flies off at the end to do her super thing, and for the first time since she met Lucy, she smiles. Happy doing what she loves, as her own woman.